This website was developed as a project of the Region 13 Educator Certification Program (ECP) Transition to Teaching grant from the United States Department of Education. The idea for this site came from a long-held practice of our program training. 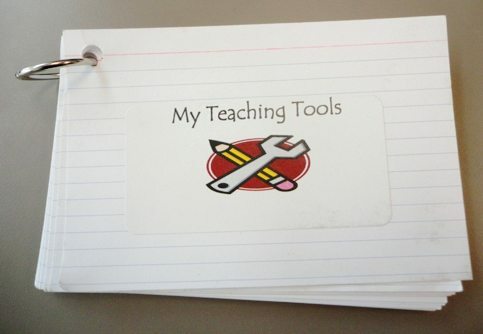 Our teachers always leave our program with a set of Teaching Tools written on index cards and held together with a metal ring, which they use to plan active and engaging lessons for their students. These easy but powerful strategies impact students at all levels and in all content areas. The purpose of this site is to share these tools with a wider range of novice and experienced teachers in a web based format including video illustrations of the tools in use. The teachers and students you will see on the site are from the Central Texas area and are all successful graduates of our program. Keep checking back as we add more strategies and video content to our tool kit. Although these tools are presented with novice teachers in mind, teachers of all levels of experience will find them useful with their students. The Region 13 Educator Certification Program (ECP) provides an opportunity for professionals from many different fields to become teachers through an alternative route to certification in Texas, rather than following the traditional college route. In our rigorous, field-based program we integrate theory with practice to help our teacher-interns make valuable contributions to public schools as they draw upon their diverse past experiences. The Region 13 Educator Certification Program has certified teachers for over twenty years through this alternative route. The ECP has evolved and grown throughout the years as we continually revise and adapt our curriculum to meet the needs of today’s beginning teachers. Education Service Center Region 13 is one of twenty service centers that serve Texas educational needs. We are a non-regulatory agency; our relationship with school districts is collaborative and supportive. Our purpose is to aid teachers and administrators in their role as educators of our children. We serve as a liaison between the Texas Education Agency and local schools districts and the schools they serve by disseminating information, conducting training and consultation for both federal and state programs.